Okonomiyaki is one of my favorite Japanese dishes. 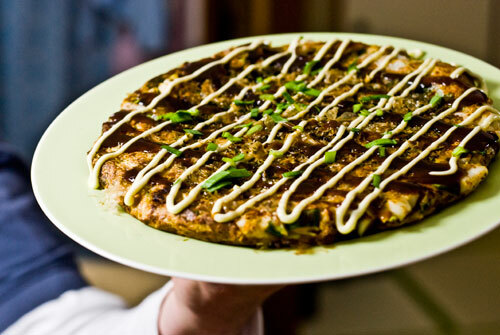 It is a delicious, cabbage-based savory pancake. The name means “grilled as you like it,” and you can augment the basic batter with nearly anything you can think of. Okonomiyaki is the regional specialty dish in the Kansai area of Japan—Osaka and Hiroshima are each known for their distinctive style of pancake, and each claims to be the home of the archetypal okonomiyaki. In the Osaka style, all of the ingredients are mixed together and cooked as a single pancake. In the Hiroshima style, on the other hand, each ingredient has it’s own layer—first comes a thin layer of batter, then some meats and seafood, cabbage, a layer of yakisoba or udon, and finally a fried egg. Either style is topped with paper-thin bonito flakes, ao-nori seaweed powder, okonomiyaki sauce (like Japanese-style barbeque sauce), and kewpie mayonnaise. Although I love to eat both styles, I prefer Osaka’s style for home cooking because the single layer makes it a lot easier to manage in a frying pan. My favorite way to enjoy okonomiyaki is to have an okonomiyaki party. To prepare, I shred about half a head of cabbage and make a big bowl of batter. Each guest brings a portion of their topping of choice. Each guest mixes up and cooks their creation. If anyone at the party has dietary restrictions or strong dislikes each person can stick with the cake that they made, but it’s really fun to slice up and share the pancakes. Maybe you’ll discover a great flavor combination that you never thought of. *This recipe uses grated mountain yam, a Japanese root vegetable that, when grated, becomes viscous and slimy. It may look very strange and even a little disgusting, but it really improves the texture of your okonomiyaki, making it more tender inside and more crisp on the surface. 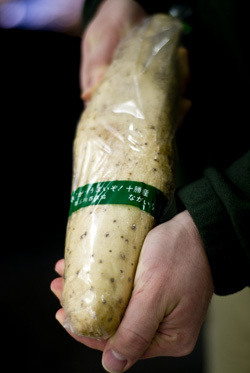 You can find mountain yam in Japanese grocery stores; it is called yama-imo or naga-imo. If you don’t have a Japanese grocery store, you can leave it out, but you may want to experiment with increasing the amount of water in your batter, and maybe adding some cornstarch or cake flour to keep the batter from becoming tough. *The batter for 6 recipe can be scaled to any group size in multiples of two. Cut the topping ingredients into small pieces that will cook in the same amount of time as the pancake. Put each topping in a small dish and arrange the dishes where your guests will prepare their mix. Stir together flour, salt, water, mountain yam, and egg to make a batter. Give each person at your party a medium to large bowl. Each person should put about one sixth of the batter and whatever toppings they like in the bowl (except bacon or noodles). Stir together. Next, heat a large frying pan over medium-high heat. If using noodles, stir fry the noodles until cooked through. Set aside and top the finished pancake with them later. Spread the bacon (if using) evenly in the pan without overlapping. Pour the batter on top of the bacon. While the pancake is cooking, sprinkle a generous amount of bonito flakes and ao-nori over the top. When the bottom is browned and it is cooked about halfway through, flip the pancake. If it is difficult to flip, you can use a large spatula or slide the pancake onto a large plate, place the pan on top, and then invert the pan and plate. Continue cooking until the cake is cooked through and browned on the bottom. Top with okonomiyaki sauce and mayonnaise, slice, and serve. If you have any leftover batter, lightly stir in a few spoonfuls of sweetened adzuki beans and cook small pancakes for dessert. Kit-Kat surprise: Add bite-sized pieces of Kit-Kat bar to your favorite combination! Well, it’s been about seven months since I left Boulder for Maebashi, Japan on the JET Program, so I guess it’s high time that I started posting about my adventures. I’m hoping to focus on cooking, dining, and travel, but since this blog is a work in progress, we’ll see how it develops.